It wasn’t until the 18th century when a more formal device to deliver electricity to decrease pain was created. Although initially developed in Europe, Benjamin Franklin is credited with reforming the original electric condenser, which was used to shock patients in an effort to treat various ailments. Using a small, battery-powered machine about the size of a pocket radio, you connect two electrodes (wires that conduct electrical current) from the machine to your skin. When the current is delivered, many people experience a reduction in pain. This may be because the electricity from the electrodes stimulates the nerves in an affected area and sends signals to the brain that block or “scramble” normal pain signals. Another theory is that the electrical stimulation of the nerves may help the body to produce natural painkillers called endorphins, which may block the perception of pain. Experts generally consider TENS to be safe, although the machine could cause harm if misused, so always follow the manufacturer’s instructions carefully. The Aleve Direct Therapy TENS Device is a brand new product from Bayer. Aleve Direct Therapy uses TENS (transcutaneous electrical nerve stimulation), a therapy that uses electrical stimulation. It incorporates two clinical theories of how TENS provides pain relief: by blocking the transmission of pain and stimulating endorphins, the body’s natural pain reducing chemicals. Aleve Direct Therapy can help relieve lower back pain due to exercise, normal household and work activities. TENS is sometimes described as producing a tingling sensation and can vary by individual and the intensity selected. Aleve Direct Therapy is adjustable for the level that feels best for you and the wireless remote makes it simple to adjust. High-frequency stimulation (sometimes described as a strong tingling sensation) initiates the feeling of pain relief by suppressing the transmission of pain signals from nerves. Find your preferred intensity level with the wireless remote control. Low-frequency stimulation in this stage feels like a gentle tapping sensation. This stimulates an increased endorphin release that can reduce the sensitivity to pain beyond the 30-minute session for some people. The unit can be worn throughout the day for repeated use but has been preprogrammed for 30-minute sessions. Of course, you can stop treatment at any time according to your needs. It is recommended that you wait 30 minutes between sessions. To help get the most relief for your particular needs, you may adjust the intensity level with the wireless remote control. With 2 buttons, you can increase or decrease the intensity to find the level that’s comfortable for you. There are 15 different levels. Aleve Direct Therapy was designed to be comfortable and mobile, so it can be worn throughout your day for repeat treatments according to your particular needs. Thirty-minute breaks are recommended between sessions. Aleve Direct Therapy is very discreet. 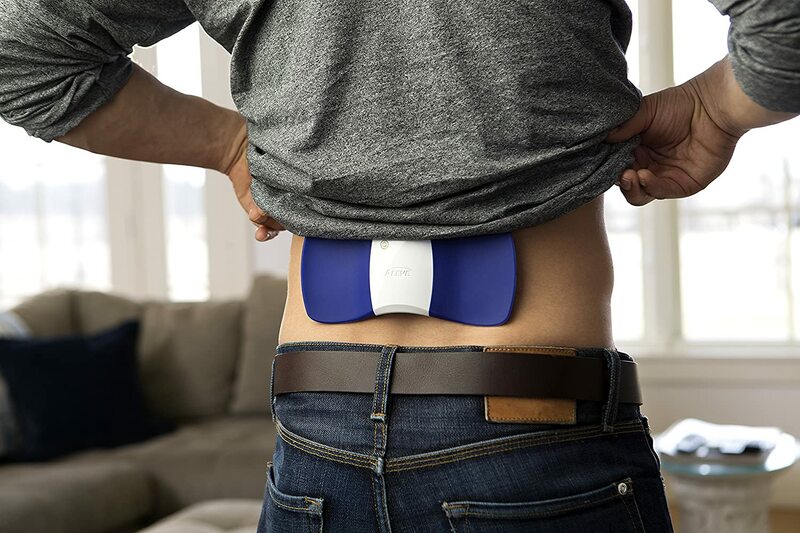 It operates silently, contours to your back and is controlled wirelessly, so it’s easily concealed by clothing other than form-fitting apparel or see-through fabrics. The Aleve Direct Therapy unit is about 3.5″ x 7″ and weighs less than 5 oz. Its sleek design was developed to cover both sides of your lower back to give you the relief you need while fitting discretely under your clothing. Aleve Replacement gel pads are free of latex and animal products/ingredients. 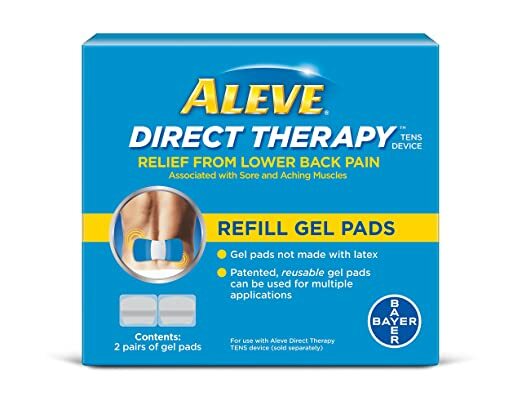 Only Aleve gel pads should be used with Aleve Direct Therapy. This will enable you to operate the device properly and help protect you from potential burns or skin irritation. No other method should be used to attach the Aleve Direct Therapy device to your back. Gel pads last for 2-5 applications on average. However, this will vary by person, depending on factors like skin type, activity level and how long you leave it on your back. 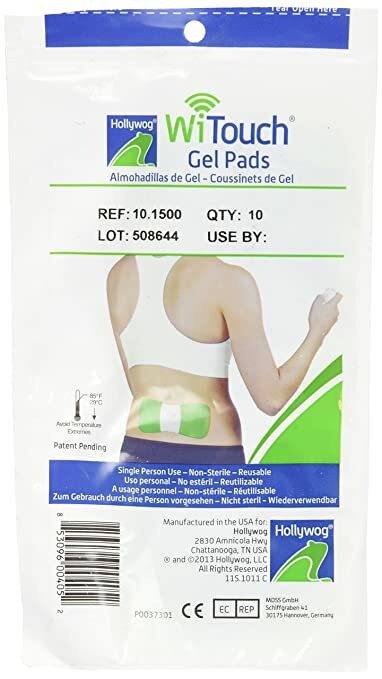 If the gel pads are not sticking to your back effectively, you should replace them. The timing will vary by person, depending on factors like skin type, activity level and how long you leave it on your back. Replacement gel pads are available at the same retailers that sell Aleve Direct Therapy and are sold in 2-pair packs. It is important to know that, even though you don’t need a prescription to buy Aleve Direct Therapy, you do need to get one to submit with your insurance claim. Aleve Direct Therapy packs easily in your carry-on bag and can go through normal screening. If you’re wearing the device, the TSA (Transportation Security Administration) suggests you tell the screener before you walk through and let him or her know it is on your lower back. Clean the device and remote using a damp cloth and mild soap. Gently wipe clean, leaving no soap residue. Do not submerge the device in water or other liquids. Note: This device has water detection technology. Water damage will void the warranty and 30-day, money-back guarantee. Aleve Direct Therapy should be stored in the storage box included with your device. If the device will be stored for a short time between uses and the gel pads are still applied to the device, the green protective liners should be applied to the gel pads before storage. If the device will be stored for a long period of time, the 2 AAA batteries should be removed from the main device. The gel pads should be removed and disposed of. Whether being stored, operated or transported, the device should be kept at temperatures from 50-104° F (10-40° C) with relative humidity between 30% and 80%. 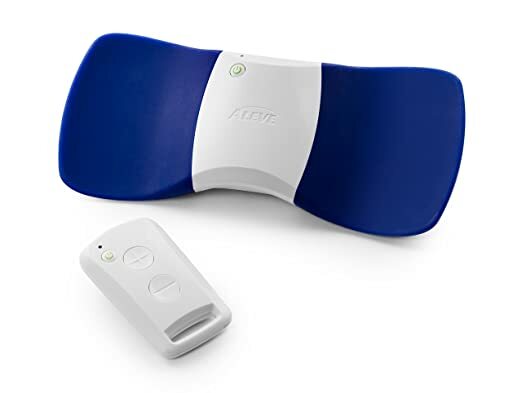 While researching the Aleve device, I came across the WiTouch Wireless Tens device by Hollywog, which is exactly the same as the Aleve product, and has been on the market for years with good reviews. Other than it’s green color, I could not find any difference between the two devices. 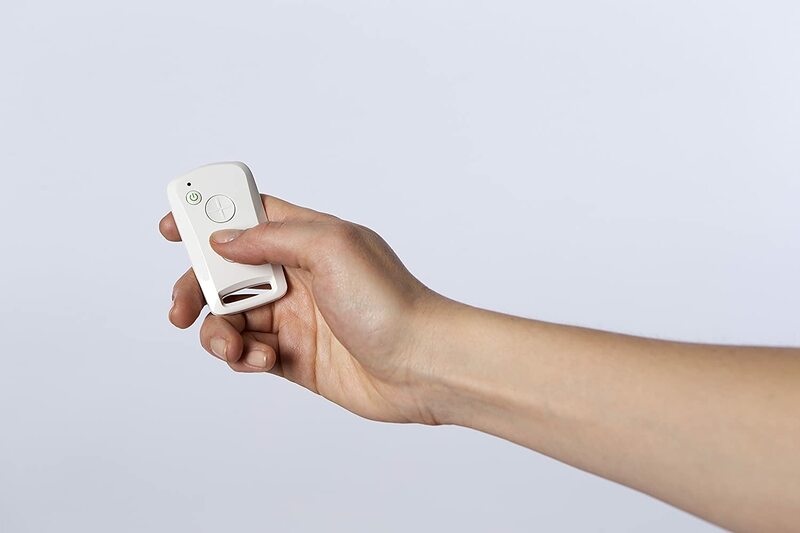 The WiTouch works on a similar waveform pattern, has the same dimensions, the same replaceable gel pads, and even the same two-button remote as the Aleve device. 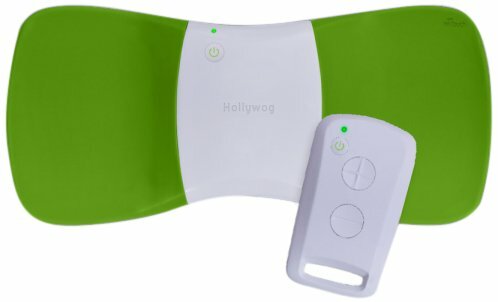 The WiTouch manufacturer, Hollywog/Core Products, was first company to produce wireless remote controlled pain relief device for consumers, incorporating TENS technology to specifically targeting lower back pain. There are over 140 reviews on the WiTouch, and users have been impressed with the device (it has a 4.1 star rating on Amazon). In my opinion, it’s worth investigating the WiTouch unit in addition to Aleve Direct. Video: news story on Australian television about the WiTouch and developer. Video: live demonstration of the WiTouch on a back pain sufferer. how much does it cost runs on battaries what kind does it work on leg pain? where can you get device been to two cvs and coudn’t find it. The Aleve Direct Therapy TENS unit is $49.88 at Amazon. How often should I use the device in a day or use it only when I have back pain? You can use the unit as often as needed for your back pain. It is recommended that you allow a 30 minute break between sessions once the cycle finishes. I have used a unit that works with my nerve pain , but it requires sepparate leads to each electrode and placement of the electrodes and leads makes it very difficult to dress and undress dealing with all the wires is a hassle. Does this unit allow for direct placement on the targeted nerve on a left calf? 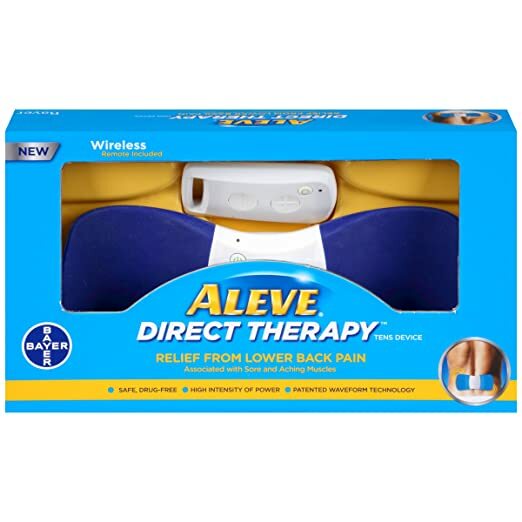 I don’t think the Aleve Direct Therapy device would work effectively on the calf because it is shaped specifically for the contours of the back. I checked the product manual, and it refers only to back pain use. You could certainly try placing it on the calf while you are sedentary, but I don’t imagine you could enjoy any mobility while wearing it. You could definitely find a more effective product for the calf area. You would probably do better with a product specifically designed for the leg like this. Can the Aleve Direct Therapy be used if you have had a spinal fusion? I am not a physician, but according to my research, there is no reason why you couldn’t use an electromagnetic stimulating device like the Aleve Direct Therapy unit. Check with your surgeon to be sure. Can it be used to help with sciatic nerve pain? The Aleve unit is now $39 on Amazon, versus $69 for the Witouch. On the other hand the pads for the Witouch are much cheaper. And they appear to be perfectly identical, so a good strategy would appear to be to buy the Aleve TENS unit and the WiTouch replacement pads. BTW the video from Australia is probably not really a “news” story – Yahoo7.com.au is the Yahoo presence for an Australian entertainment and lifestyle channel. So the story is really more promotion than news. Can Aleve Direct Therepy be use for heirniated disks? Aleve Direct Therapy can help ease back muscle soreness associated with your herniated disks, but will will not solve the underlying issue with the disks themselves.